Ontario is calling for GHG reductions of 15% below 1990 levels by 2020 and 80% reductions by 2050. Ontario has made significant progress lowering emissions by phasing out coal-fired electricity. 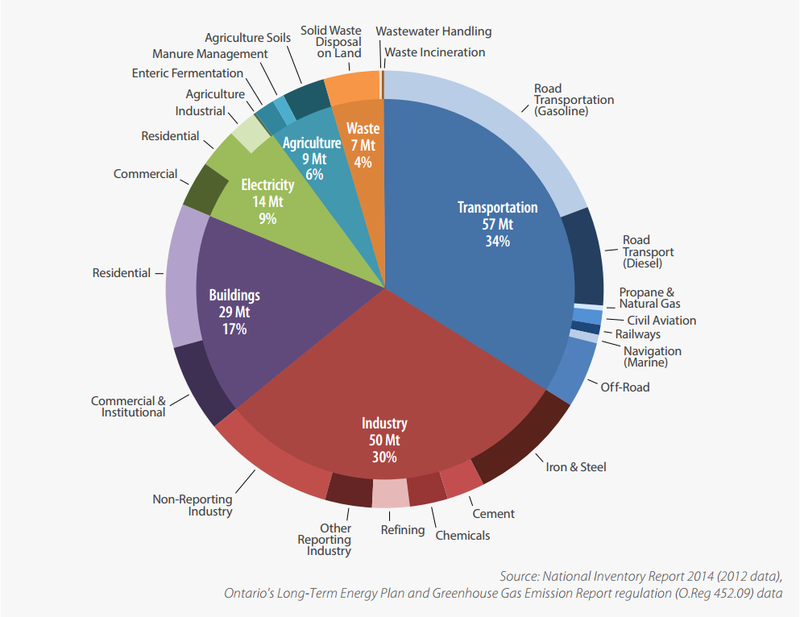 However, emissions from the transportation sector have continued to grow and account for 34% of all GHG emissions in Ontario. 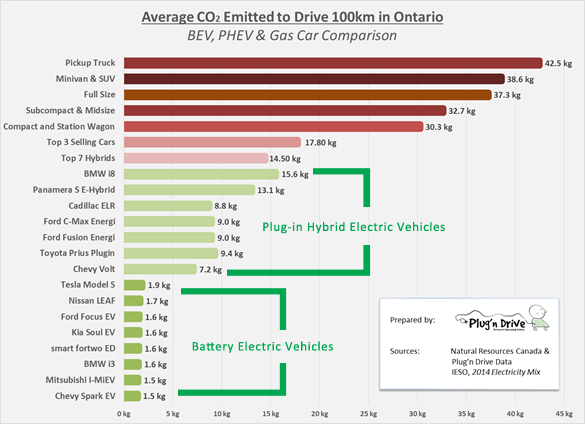 Plug’n Drive estimates that a driver can reduce their GHG emissions by as much as 67-95% by switching to an EV and using Ontario’s clean electricity for fuel. As of February 2015, there were more than 3,825 electric vehicles in Ontario with the potential to offset as much as 12,910 tonnes of GHG emissions and reduce gasoline usage by as much as 5.8 million litres per year. Sales increase 100% annually to 2020 and stabilize at 32.5% through to 2050. As you can see, in each scenario the GHG reductions from EVs is significant and EVs can play a key part in helping Ontario reduce its dependence on oil. Provide an incentive to Ontario’s municipalities that make EVs a part of their fleets. The full report is available for free download at Electric Vehicles: Helping Ontario Reduce Greenhouse Gas Emissions. It really needs to go further. If the goal in Ontario is to have 10% of vehicles BEV, then any new condos should be required to have at least 5% of their parking spaces serviced by L2 chargers – 2 or 3 parking spaces per charger. Maybe staged as 5% serviced/roughed in, and a requirement to install some minimum number of chargers, and additional chargers when either when asked or when the existing chargers approach some use level threshold. Similarly, there should be requirements on all office buildings, malls / strip plazas, industrial and office complexes to install a minimum number of chargers. It’s quite clear that getting more drivers into an EV can help us meet our GHG emissions targets in Ontario. What might be interesting is how Ontario’s plans for a cap-and-trade framework in collaboration with Québec and California might help to stimulate adoption of this technology at the consumer level. This looks like a good report! I would like to add that building any car (EV or not) from scratch has a huge GHG footprint, which anyone can get rid of by converting old cars with the help of a mentor and a good mechanic! Check out my blog where I am chronicling the conversion of my 1974 Saab Sonett over the course of this year.